I used to go to salons for cellophane treatment which is worth 400Php and up. Now, I’m very thankful that I saw Shine Moist Henna Wax Color Treatment in Hortaleza because some of the salons I went to uses this. 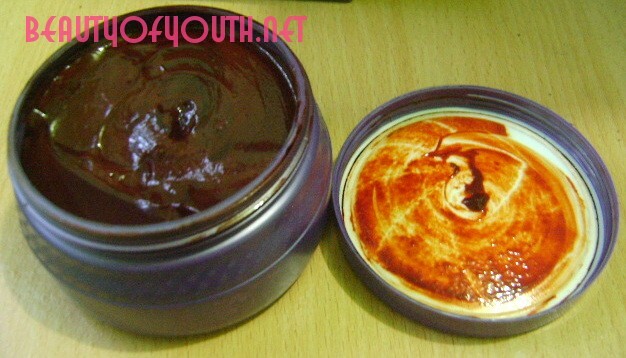 I bought the medium brown color of Shine Moist Henna Wax which is 100ml worth 185Php. One box contains the Shine Moist Henna Wax Color Treatment, pair of plastic gloves and a plastic cap. It is also available in HBC. Available colors are black, dark brown, brown, magenta, cyclamen, medium blonde, ruby, natural, golden brown, light golden blonde, magenta red, red blonde, chestnut brown, chocolate brown, medium brown, burgundy red, chocolate red and orange red. 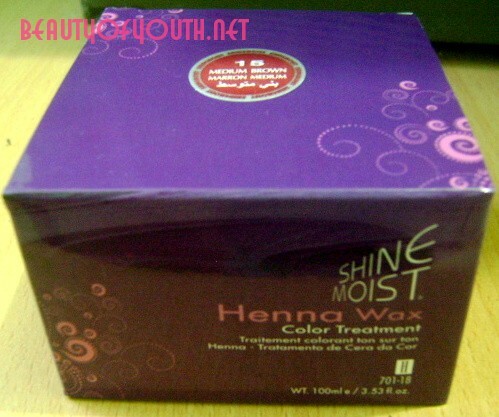 This is what is written at the back portion of the box: Shine Moist Henna Wax Color Treatment is especially designed for dull and damaged hair with its unique formula which is competent to penetrate deeply with protecting the cuticular layer of hair while the color treatment is processing. Exclusive natural color treatment and rich protein bond ingredients helps give nutrition, leaves hair exceptionally soft plus natural color looking. Note: Try a skin allergy test before using Shine Moist Henna Wax Color Treatment. 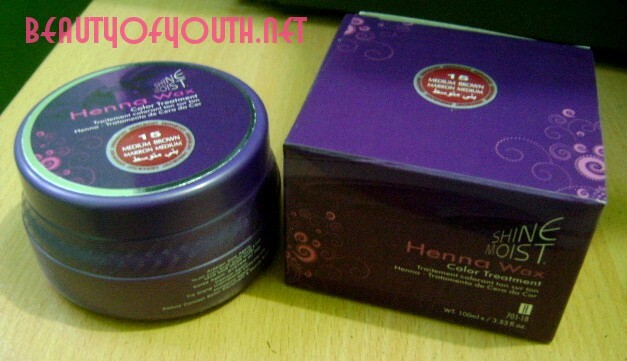 Wear dark clothing or use any protective coat to avoid stains from the Henna Wax Color Treatment. Shampoo and towel dry hair to 75% dry. Apply color treatment beginning 3 mm from scalp and comb through the hair thoroughly. Keep hair moistened and heated with a steamer or heater for 30 minutes. Allow hair to cool for 5 minutes before rinsing thoroughly until the water runs clear. Squeeze out excess water and apply conditioning rinse and leave it in the hair for at least 1 minute. Rinse thoroughly with water, blow dry and style. I followed the first and second directions from the box. I left Shine Moist Henna Wax in my hair with the plastic cap they’ve provided for almost 45 minutes because I don’t have a steamer or heater. I removed the plastic cap and let my hair cool for 5 minutes and then rinsed it with water. After that, I followed the fifth and sixth directions. It makes my hair shiny.